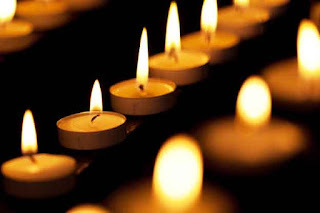 On March 29, 2019, Charlotte Yinger passed away, returning home to God. 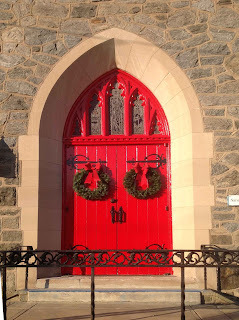 She lived at the Elwyn Institute. Charlotte is survived by her sister Eleanor, her uncle Joseph Yinger, and several cousins. 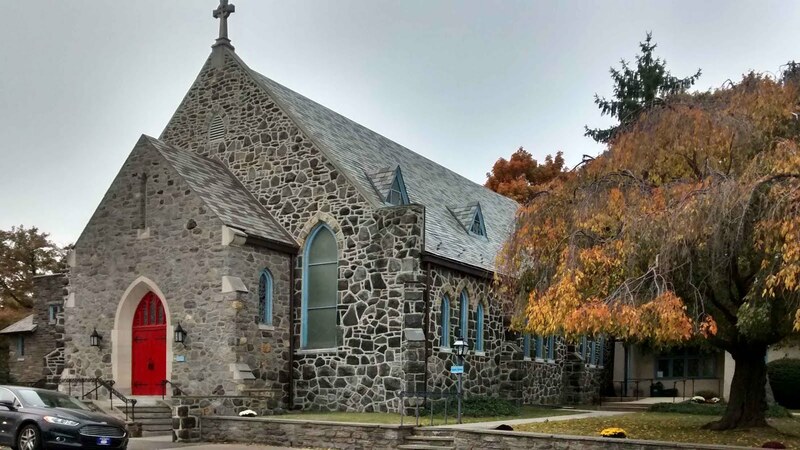 A memorial service will be held at the Elwyn Institute at a later date. 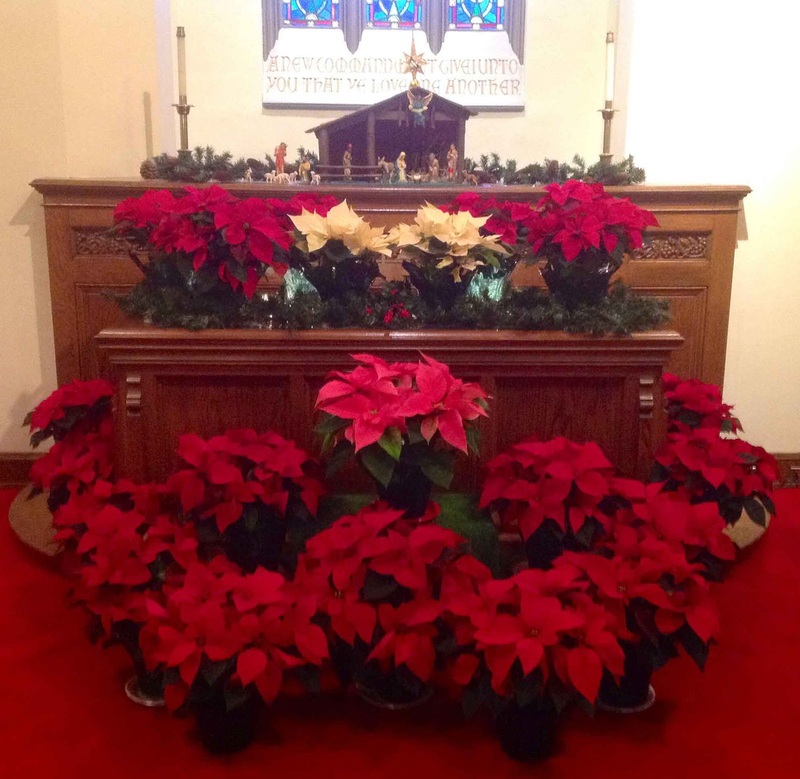 In lieu of flowers, donations may be sent to Lansdowne Baptist Church or the Elwyn Institute. 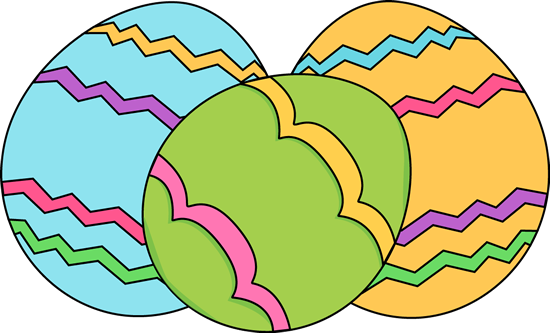 Lansdowne Baptist Church will hold an Easter Egg Hunt for the young children (first grade and below) on Saturday, April 13, from 1:30 p.m. until the last Easter egg is recovered (no later than 2:30 p.m.)! We will be gathering and hunting on the grass outside the office wing near our parking lot. This hunt is open to children from the community and we look forward to seeing you there. Happy hunting. May the blessings of Easter be yours! Don't forget to "spring forward" this Sunday at 2 a.m., moving that clock forward an hour for daylight savings time. Don't be the person showing up at the very end of church, thinking everything is just about to begin. Spring ahead and join us for Sunday moring worship at 11 a.m.
On Christmas Eve this year, we at LBC once again have a special treat for everyone who wishes to celebrate Jesus' birth. At 7 p.m. on Monday, December 24, 2018, we will offer a family-friendly variation on a service of lessons and carols. We will be singing, reading much-loved scripture passages and responses to those scriptures, hearing a brief meditation from the pastor, and closing with a beautiful, candlelit singing ofSilent Night. During this simple service, all who attend will be offered the opportunity to slow down, pause, and remember why we celebrate Christmas. It will be a time of worshipful release from the tension, the expectations, and the anxieties that so often accompany this busy Christmas season. Together we will experience the joy of Jesus' birth once again. All are invited to join us for the evening's joyous worship. On Sunday, December 23rd, 2018, at 7:00 in the evening, you are invited to Lansdowne Baptist Church's annual Christmas Candlelight Service. 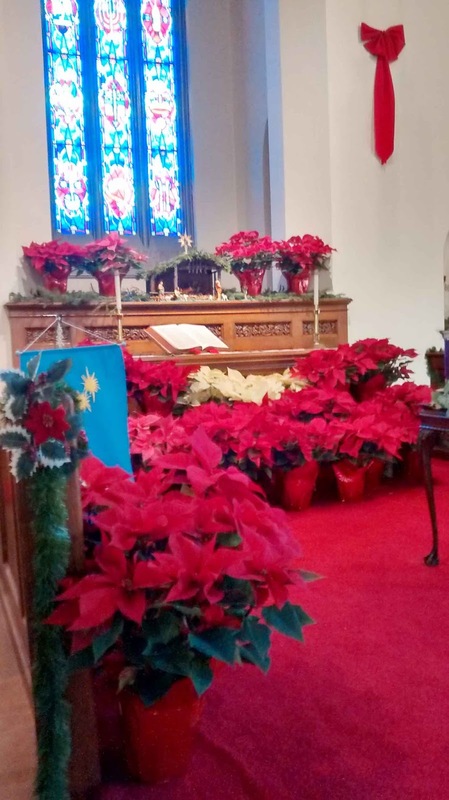 This inspiring service includes a service of lessons and carols. 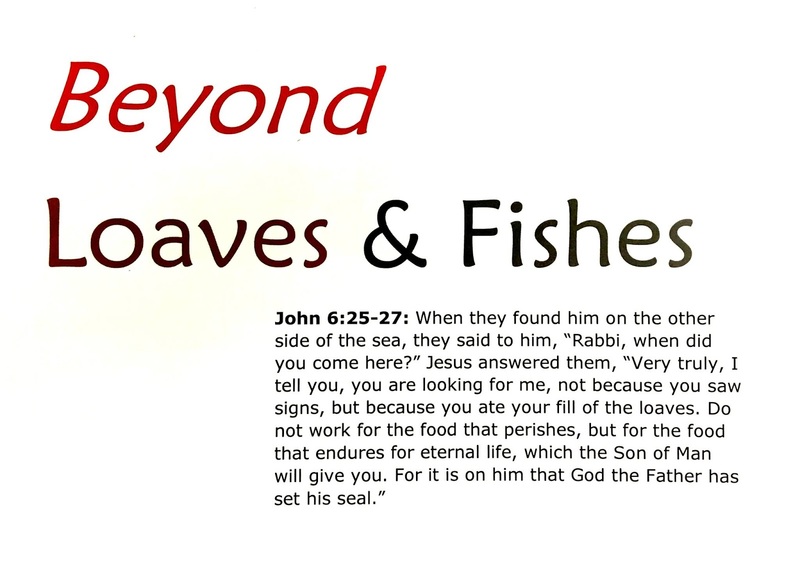 The lessons span both the Old and New Testaments. Follow the story of God's love for humanity, a love so strong that nothing we could do would destroy it, from the very beginning through the joyous birth of Jesus, the Messiah, who would show us the way home to God and declare in word and deed how much we are all beloved children of God. This is a wonderful assurance in challenging times. 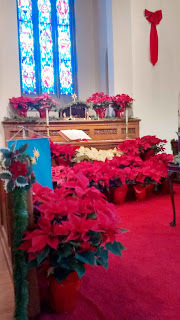 Following the lessons and carols is a truly unique message during which the light of Christ is shared throughout the church sanctuary, taking a single point of light at the pulpit out throughout the gathered people, sharing Jesus' love and message until the sanctuary, once dark, is fully illuminated by candles. By that warm glow, together we sing Silent Night to end a beautiful, inspiring, and memorable evening sure to give you the real Christmas spirit. Come and join in this profound moment of worship and peace. Come and share our joy. All are invited. Here's a reminder from your friends at LBC. 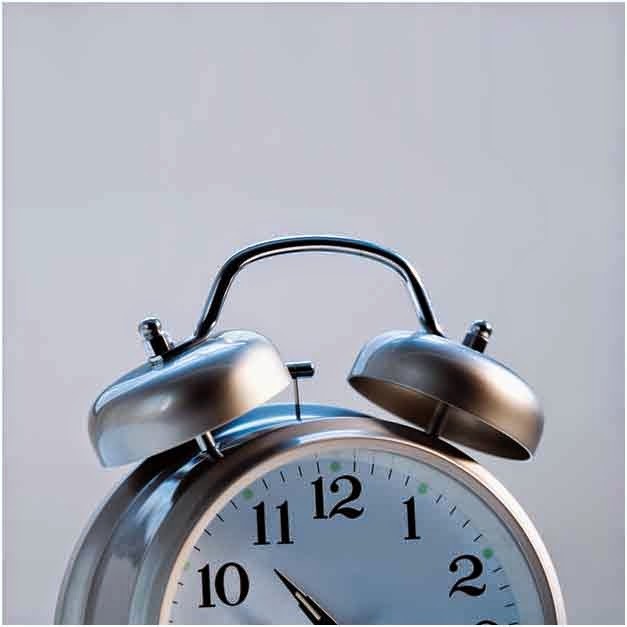 Set those clocks back one hour Sunday morning at 2 a.m. Get an extra hour's sleep so you will be refreshed when you come to worship with us Sunday morning. Sunday school begins at 9:45 a.m. and worship service in the sanctuary starts at 11 a.m. We look forward to seeing you there! On Sunday, September 9, 2018, Lansdowne Baptist Church returns to our fall schedule. 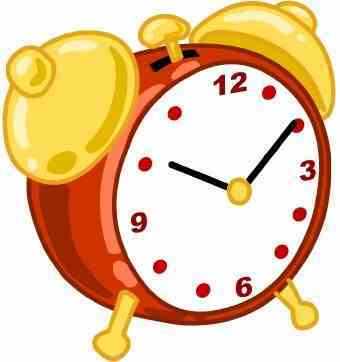 Sunday school starts up again at 9:45 a.m. in the education wing. Worship service in the sanctuary returns to 11 a.m. Make a note so you won't be early to the sanctuary. I encourage everyone to join our morning Sunday school classes. It is a great way to stretch your knowledge and enrich your journey of discipleship as a Christ follower. 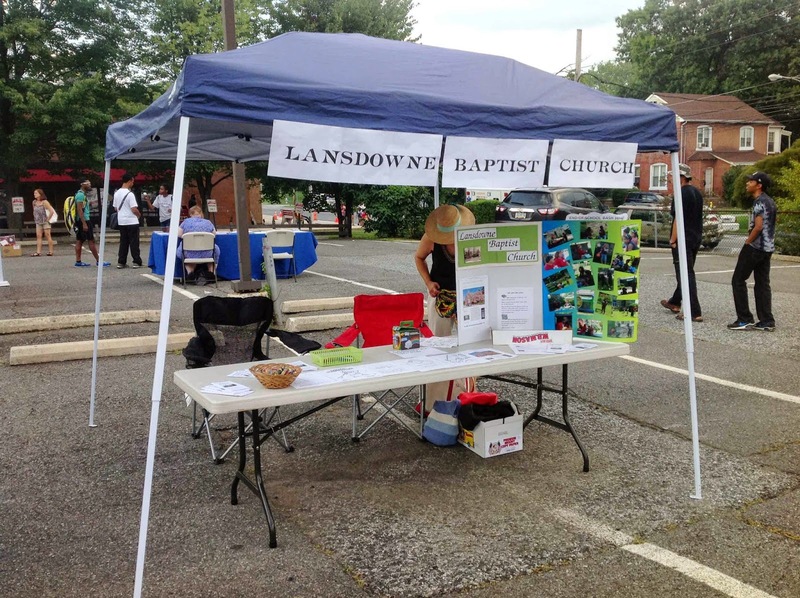 Lansdowne Baptist Church will once again be attending the National Night Out in Lansdowne, Pennsylvania, on Tuesday, August 7, 2018, from 6 to 8 p.m. It is always a joy to meet everyone from the neighborhood who comes to celebrate with us. We look forward to seeing each and every one of you there. Come by and say hello. I believe we will also have large bubbles for the kids to blow. 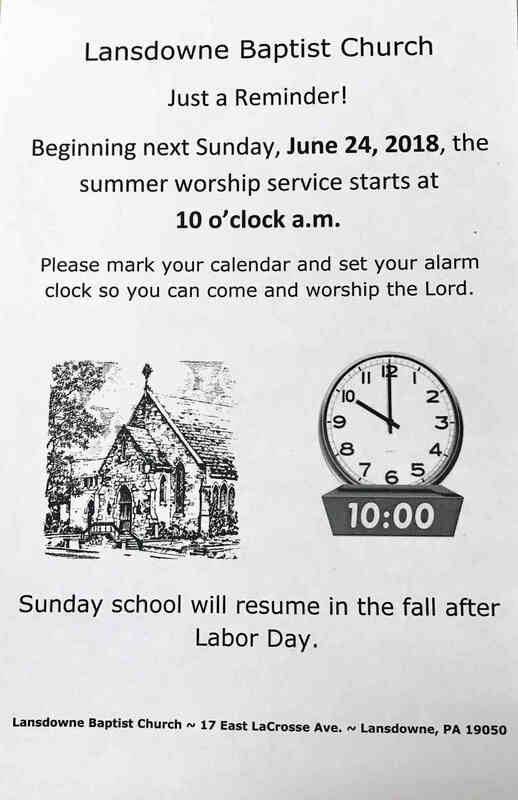 It is time to change over to our summer hours after Father's Day, on Sunday morning, June 24, 2018. 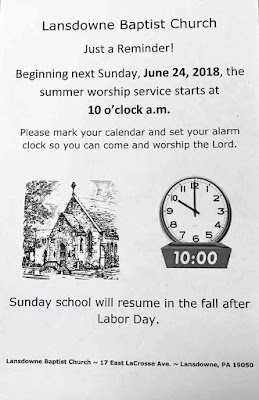 Sunday school will go on summer vacation. Sunday morning worship will start at 10 a.m. instead of 11 a.m. We look forward to seeing you then. If you haven't come to worship with us before, consider yourself invited. All are welcome. Our live stream Bible study was a success on its first Tuesday evening, although a thunderstorm threatened to knock out my internet connection at the last minute. The second Tuesday evening we had a problem with the encoder, which I believe is now solved. So, we're going to dive back in Tuesday, May 29, 2018, continuing our study of the book of Esther for another half an hour. Stop on by and join us. What we had here was a failure of equipment to communicate! We did not have the opportunity to have our Bible study, the second week of the book of Esther last night, Tuesday, May 22, due to a failure of the encoder and YouTube to communicate with each other. It took an hour and twenty minutes to track down the problem, but I believe it is solved now and we'll be able to move forward again next Tuesday, May 29, at 8 p.m. I hope to see you all there. In the video here is an explanation of the issue and an answer to some general questions that came up in our first week. Any new venture has challenging moments and this one was mine. I apologize for the inconvenience, but it was a real learning opportunity. As the prophet Jeremiah said in chapter 8, verse 4: When people fall, do they not get back up again? He calls his people not to be involved in perpetual backsliding but to get up again. So we will in this case. Proverbs 24:16 gives us a reality check, reminding us this will not be the only time I stumble in the production of this live stream. As the text says, for though the righteous fall seven times, they will rise again. I have fallen once. I hope not to fall again soon, but who knows? I hope you will stay with me for the adventure. Things will get better as we move along, learning together how this all works. We will also learn many valuable life lessons from the Bible as we study together. Have a blessed day. I hope to meet with you next Tuesday evening from our respective homes. Once again, I apologize for this delay. 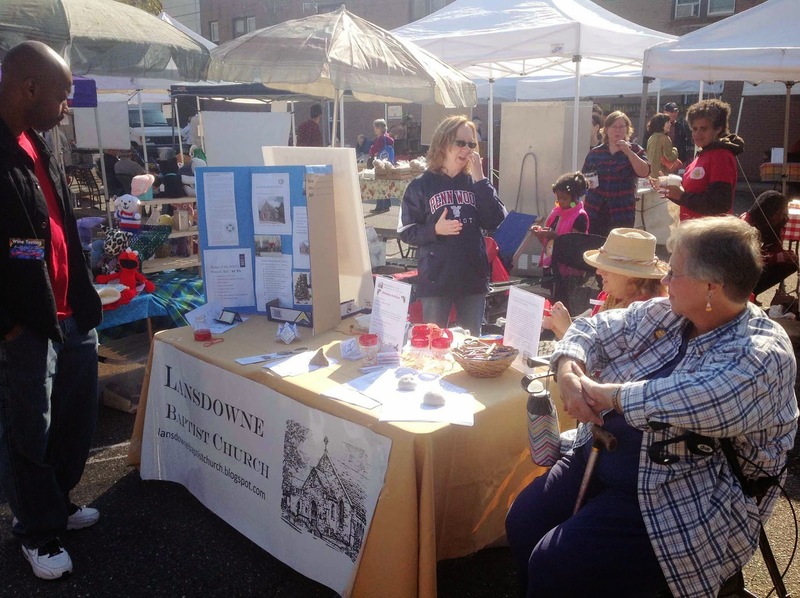 Lansdowne Baptist Church is holding its much-loved pancake breakfast in Lansdowne, PA, on Memorial Day. Breakfast will be served from 9:00 a.m. to 12:00 p.m. on Memorial Day, May 28, 2018. 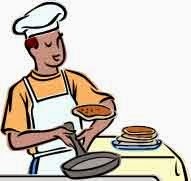 The cost for the pancake breakfast is $7.00 per person for adults; $5.00 for children (12 & younger); and $20.00 for families of 5 or less (immediate family only). The food is fantastic and the funds raised go to a good cause. The funds raised support our Aaron Royal Scholarship Fund, which provides two graduating high school students from the William Penn School District (and/or members of Lansdowne Baptist Church) who are heading off to college with scholarship money from LBC. This is one of the many ways we support are community. 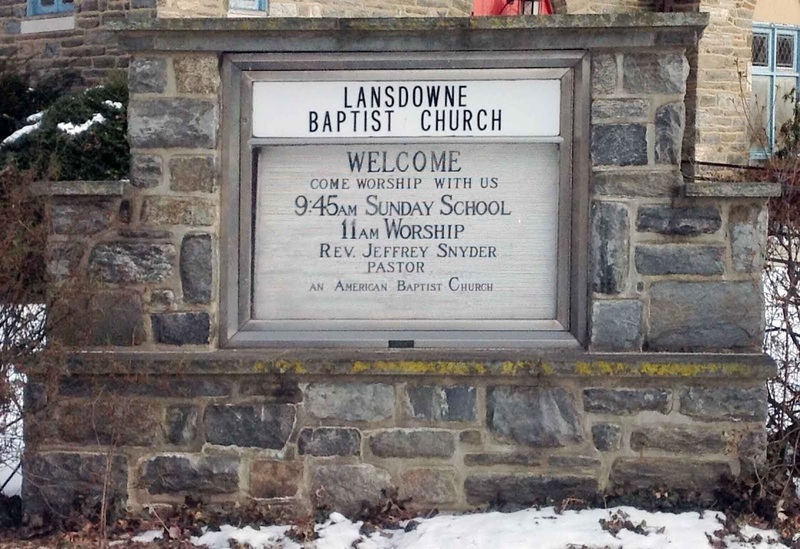 Lansdowne Baptist Church is located at 17 East LaCrosse Avenue, Lansdowne, PA 19050. 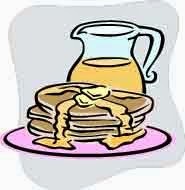 Come hungry and enjoy the breakfast our terrific cooks create and help our local students. We are called by God to try new things, to follow where God (our great and glorious change agent) leads us. I am heading in one such direction where God is leading. 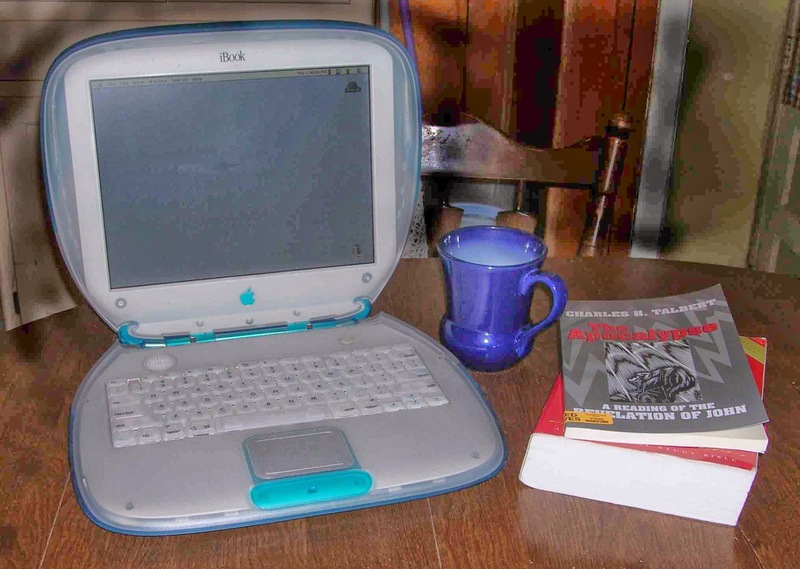 At this point, I have all the technology and programming to offer up an evening live stream Bible study, filled with applications for modern life, with Bible verses read in the biblical storytelling fashion. Lansdowne Baptist Church members, friends, and all seekers anywhere interested in participating will be invited to join in. There are a couple of experiments needed to work out the finer details and then we will jump in with both feet. At that point, we will announce when the first meeting will take place (day and time), along with the YouTube channel through which you will be able to join in. If it is set up as I envision, chatting will be possible. There will be a few Bible-based rules for those conversations, but that will come later. As one very astute individual who is jumping in early remarked, "We won't go for perfection at first, but we will walk toward it over time." Too true. Join us early and watch the changes happen. Through it all we'll learn together what our loving God through the Bible, that amazing library of 66 books, has to tell us about living modern life well. We will equip ourselves with that knowledge. Then we will encourage each other to act on what we've learned to help others and grow in our faith. Watch this blog for more news soon. Until then, walk with God. On March 29, 2018, Lansdowne Baptist Church will celebrate our Maundy Thursday Tenebrae Service of hymns, Scripture readings, and candle light. The service covers Jesus' passion, the events leading up to and including his crucifixion. The service begins at 7 p.m. with a simple soup and bread meal preceding it at 6:30 p.m. Eight candles are lit, eight Scriptures are read. With the reading of each passage, a candle is extinguished, until with the final reading is done and the room submerged into darkness. 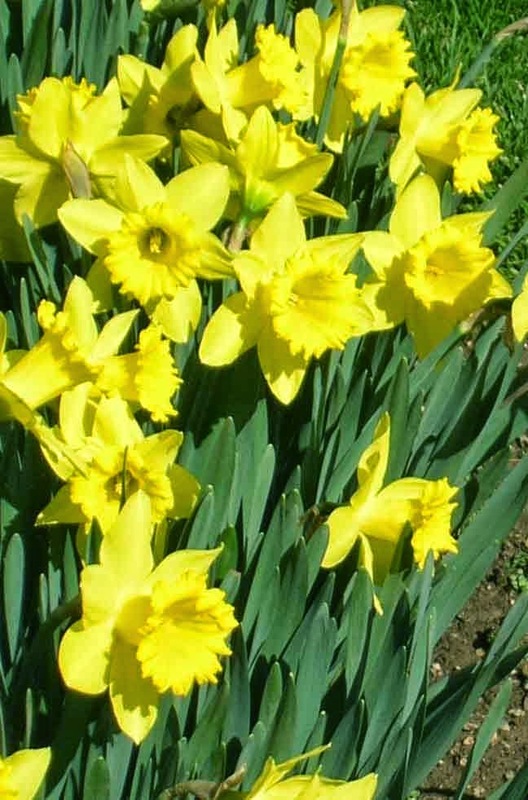 It is a moving time of reflection, taking us up to the moment of Jesus' death and leaving us there until Easter morning, when we celebrate Jesus' resurrection and all that means. Given the snow expected today, the Lansdowne Baptist Church office will be closed. The pastor will be working from home and may be reached there. Stay safe and warm everyone. The snow is expected to be heavy today, "heart attack snow." Shovel slowly. Give yourself plenty of time. There is no prize for getting done first. Check on friends and neighbors, particularly the elderly. Pray the power remains on and all those work crews out there clearing roadways stay safe. Don't be caught arriving late to church this Sunday, March 11, 2018! Remember to set your clock ahead Saturday night at bedtime (okay, if you want to be precise, stay up until 2 a.m. Sunday morning and move the clock ahead an hour). We look forward to seeing you in worship after we've all sprung ahead. Please take note that, due to inclement weather, the church office is closed today. The pastor will be working out of his home today and may be reached by phone or email. Tonight's Lenten Prayer Service is also canceled. We will gather together again next Wednesday night and get the prayer services back on track. Please take care today. Stay safe and warm. Shovel this heavy, wet snow in small increments, taking plenty of breaks. No heart attacks today please. Check on your friends and neighbors, particularly the elderly. Let's all follow the two greatest commandments today, loving God and loving neighbors, pitching in wherever we can. God bless us all, today and always. Given the weather forecast for tomorrow, Wednesday, March 7, 2018, we are going to cancel the Lenten Prayer Service at 7 p.m. in the Cooper Room. So, tomorrow night, hold a private worship time in your own home, reflecting on what Jesus has done for us and how we may transform our lives to more closely conform ourselves to the ways of Jesus. We will resume, weather permitting, next Wednesday, March 14, 2018, at 7 p.m. We hope to see you there. Everyone is invited. Tomorrow night we pray everyone stays safe and warm. We thank the road crews and the power company repair crews out in the weather and the aftermath of last Friday's powerful snowstorm and winds. We appreciate all you do. Stay safe as well. Consider yourself invited to the next three Lenten prayer services, Wednesday evenings at 7 p.m. on March 7, 14, and 28. We will be focused on the topic of diversity this season, using author Douglas Avilesbernal's excellent book: Welcoming Community: Diversity That Works. On March 7, we will focus on Responding to Change. On March 14, we will explore Letting Go. Finally, on March 28, we will consider Following Jesus through all the changes embracing diversity entails. It will be an exciting series. We hope to see you there. Services will be held in the Cooper Room and are informal. All are welcome. 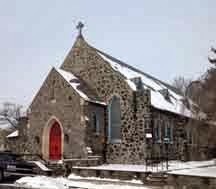 The weather outside may have been frightful last night, but our worship service will be delightful. Join us for this first Sunday of Lent, 2018, and see for yourself. Drive carefully. 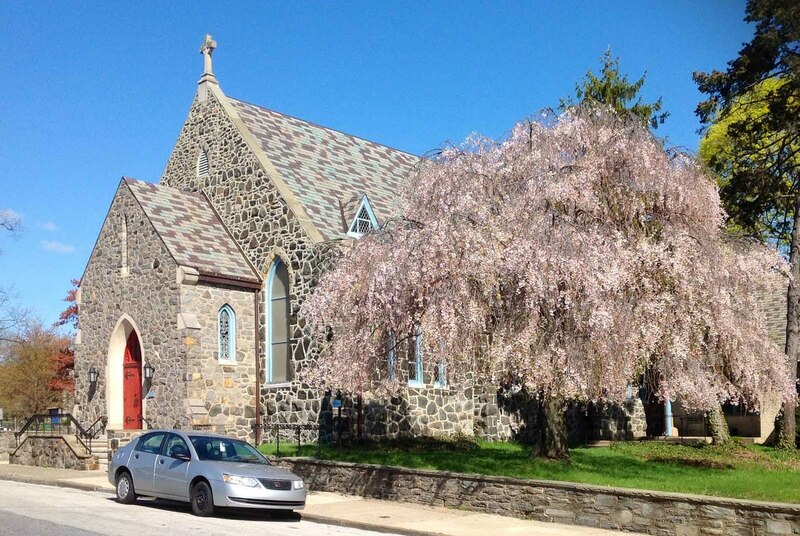 Sunday, September 18, Worship Outdoors at 11 a.m.